As part of our preparation we’re trying to read as many travel books as we can about Greece. 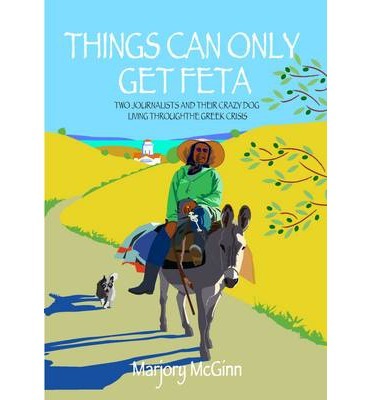 The most recent one that I’ve finished is “Things can only get feta” by Marjory McGinn. This is the story of two Scottish journalists, Marjory and Jim, who, together with their dog, leave the bad weather and recession of Britain in 2010 for a year’s adventure in the southern Peleponnese. Obviously, as we all know, Greece in 2010 was already deep in recession and moving towards crippling austerity and political turbulence for the next few years. But even though the greek crisis features on the cover the economic situation is really just a minor part of this book, which concentrates on the inhabitants of a small village in the Mani, Megali Mantineia, and the author’s increasing love for Greek life. Being a journalist, the lady knows how to write and tell a story. She combines amusing anecdotes of cross-cultural differences and language mishaps with insights into Greek village life. She paints a particularly vivid portrait of Foteini, the woman depicted on the cover, with whom she develops an unlikely friendship. Foteini is one of that dwindling pre-WWII generation of Greeks who ekes out a living raising goats and growing olives but could not imagine retiring and living quietly at home. But what would I do every day without all my goats, tell me that? Sit in that old house all day knitting pullovers? That sounds so like my own father who recently, at the age of 79, painted the interior of a double storey house by himself and then climbed up a ladder to fix the gutters. For that generation work wasn’t just something that had to be done Monday to Friday until you retired but a noble and life-affirming thing. It is impossible to review this book without mentioning their crazy Jack Russell, Wallace. I can only say that while he seems an entertaining and affectionate dog the account of his adventures has convinced me to never, ever own a Jack Russell. However the main star of this book is the region of Mani itself. Marjory and Jim try to explore as much as they can and their daytrips to tiny mountainous villages, medieval towns and sunny coves will have you wanting to visit as soon as you can. Thanks very much for reviewing my book Things Can Only Get Feta. I am glad you liked it. However, you did get a few things wrong. My partner is called Jim and yet you have christened him Mark in one paragraph and Jack in the another. It sounds like I was travelling with multiple partners. Perhaps you had to speed-read the book on hot Zakynthos days. Thanks for commenting and sorry about the errors – I’ve fixed them up now. 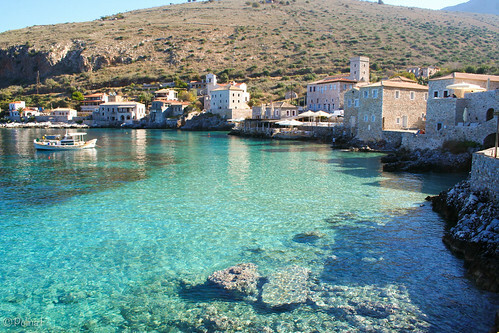 I think I actually read the book in Brisbane on the bus to work – probably daydreaming about Greece too much!